There is always the tendency for coaches and players to play down expectations and goals going into a new season. At both the Guinness PRO14 launch in Glasgow and at various media matchday briefings this week few of the clubs were setting out their stalls too early. It was interesting at the launch to hear both Ulster captain Rory Best and his Irish team mate, Jonathan Sexton, who skippers Leinster this year, both highlight every team was starting level and that meant everyone had the same opportunity. Given the season Ulster had last year, there has been much talk of the expectations being somewhat lower for them this year after a changing in the guard over the summer both on and off the pitch. Events of last season do not need to be revisited, but certainly the club will not want to have to go through the off the field events which left a dark cloud hanging over the Province for most of the season. On the field Ulster spluttered in starts and fits, the changing of a coach midway through obviously did not help. 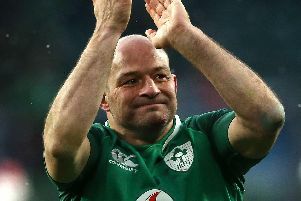 There have obviously been significant retirements or departures at the end of last season, some experienced players among those including Andrew Trimble, Tommy Bowe, Paul Marshall and Robbie Diack. The departure of physiotherapist Gareth Robinson is also considered huge, given he was the heart and soul of the Province. His influence inside and outside the dressing room could be one of the more significant absences felt this season. Talk of clean slates and rebuilding have been aired, but this is not about starting afresh or starting all over again, there still remains a strong nucleus from last season. New head coach Dan McFarland finally stepped into his office at Kingspan Stadium 12 days ago while Jared Payne and Dan Soper have also joined the backroom staff. And as for the departure of the experienced players. Well some did not feature on the starting XV much last season and the replacements that have come in Jordi Murphy, Marty Moore, Billy Burns, Will Addison and, albeit short term, Henry Speight are not just out of school, they bring with them a wealth of experience. The return of Marcell Coetzee - for a second time - having missed his first two years in Belfast with serious injuries is another huge boost, and if he can manage to get through the season unscathed, it will be like having another new signing. Add in some of the youngsters we saw over the past couple of weeks in pre-season friendlies, the roster is not looking too bad! In terms of goals and expectations, for the Guinness PRO14, the minimum for Ulster will be a place in the Championship play-offs - a third place finish in conference B.
Finishing fourth and securing European Champions Cup rugby in a play-off as they did last season, is not something they will want to go through again. Ulster won five or their last six games (the other was a draw) to finish last season on a high and it is important that is not forgotten about, as well as the other events around last season, as the new campaign begins today. Dan McFarland may have a new look side going into the opener against Scarlets this evening at Kingspan Stadium, but he has good resources available, including what is expected to be a strong vocal support. The talk in the build-up is about wanting to put down a marker and historically, Ulster have not lost an opening PRO14 game since the 2013 campaign. September will, however, tell a tale when after Scarlets they face a resurgent Edinburgh and then the focus will turn to their away day form when they are in South Africa for games against a Toyotah Cheetahs side among the favourites to take the title this term and a Southern Kings outfit who have been strengthened with some new recent signings. The key for Ulster this year will be finding stability and consistency. If they can also keep the injury profile low - it has been horrendous in recent years - there is no reason why they cannot secure a home play-off come May. Europe is of course a different beast. Ulster will need to have their strongest available side for the pool games against Leicester Tigers, Racing 92 and Scarlets. Not making the knockout stages once again cannot be counted as failure, however. The focus for Ulster must be on the domestic front and ensuring the realistic expectation of making the play-offs - at home preferably - is achieved. That will be seen as acceptable progress.